"[People] think that we are just you know, bad people and that we don't know any other way to live, and that's not true, many people are addicts that are really good people." SPOKANE, Wash.-- Substance abuse and mental illness often go hand in hand. Addiction Center reported over 6.8 million people suffer from addiction, are also battling mental illness. When you think about a solution, rehab and treatment programs often come to mind; but what happens after that? Recovery Café Spokane is the only one of its kind in Eastern Washington. Jaye James and Ray Sanderson have called Recovery Café Spokane home for the past 10 months. They don't live there, but they do see family every time they come in. 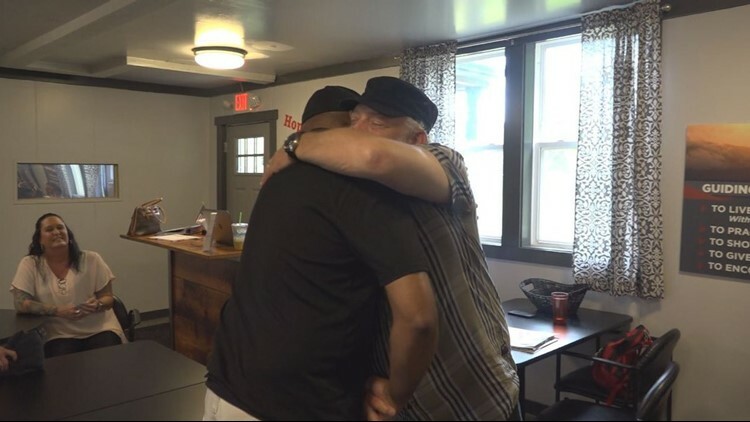 "There's always like a hug, you know, there's food served here and it's just really a great place for people to connect," said James. "I might not know you, but I still love you because we share that commonality you know, of addiction," said Sanderson. Both James and Sanderson suffer from mental illness and addiction. "I was an athlete growing up, I had friends, I didn't come from this home where I was abused or anything like that, I was just a normal kid growing up in a big family, I loved it and do you know? Come to find out, I've been through a lot of tragedy that I didn't think was tragedy," said James. James said he's not sure which came first, mental illness or his addiction to alcohol, but he knows it started when he lost his mother about 20 years ago. "My counselor at the time said that my depression was some of the worst that she had ever seen at the time," he said. For Sanderson on the other hand, it all started with a surgery in 2012. Surgeons removed a tumor the size of a football from his body. "I became addicted to pain pills because of the surgery, and then I got cut, cold turkey off of the pain pills and so I went searching for a relief from that, and that's when I was introduced to drugs," said Sanderson. Both James and Sanderson eventually found themselves at Spokane Treatment and Recovery Services. However, after treatment, they felt there was still work to do. According to American Addiction Centers many people who attend formalized treatment programs often suffer relapses. Depending on the individual and their addiction, support in the form of mentoring and community can be very important for an addict's continued recovery. Luckily, both James and Sanderson found Recovery Café Spokane. It’s a place that offers recovery circle discussion, educational classes, inspirational guest speaker meetings and fun activities like game and movie nights. "I'm not just an alcoholic, I'm not this face of, you know, this guy is a drunk or bum, or this this this, I want people to just look at me and see that this is a person, that they wouldn't know I was an alcoholic if I didn't tell them," said James. "I just try to give love, you know? And this place is love." "[People] think that we are just you know, bad people and that we don't know any other way to live, and that's not true, many people are addicts that are really good people," said Sanderson. The National Institute of Health said recovering addicts need a foundation of at least two years of sobriety to ensure long term recovery. Recovery cafés like the one in Spokane, provide support to help people break that cycle of addiction, mental health challenges and homelessness. James is now a recovery coach at the café and Sanderson is also hoping to become one soon.